I think there are more scenic, free campsites in Utah than in any other state. Southern Utah is the ultimate adventure destination but its rugged beauty is actually not available to everyone. For the most part, it is reserved for those who are willing to forgo a few luxuries. In some of the most picturesque locations, hotel rooms simply don't exist. Even in nearby towns they are scarce; as are restaurants. 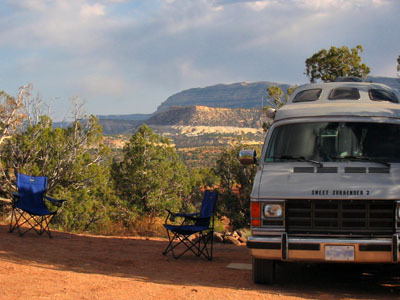 For RVers, full service campgrounds (with hook-ups) are also hard to find but, if you enjoy boondocking or tent-camping, you'll think you've died and gone to heaven in southern Utah! Once again, we were amazed at how many scenic free campsites we discovered, many of them near this state's most popular parks and tourist attractions. 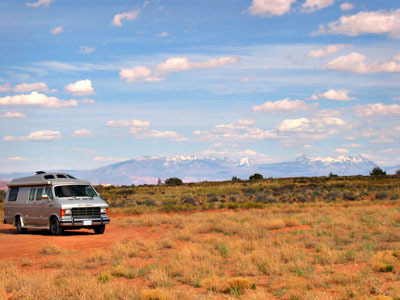 For instance, we found free camping just outside Bryce Canyon, Canyonlands, Arches, and Zion National Parks. Of course the secret, as always, is finding these legal free campsites. And I've done that for you! 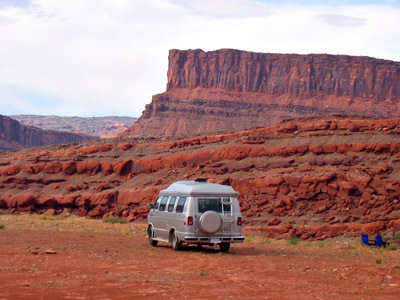 The Frugal Shunpiker's Guide "RV Boondocking In Southern Utah" provides precise, easy-to-follow directions to 129 frugal or free campsites that we personally use near the most popular (and lesser-known but waiting for you to discover them) destinations in southern Utah. 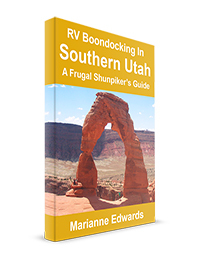 "RV Boondocking In Southern Utah - A Frugal Shunpiker's Guide"
This 165-page printable eBook is now available for immediate download. 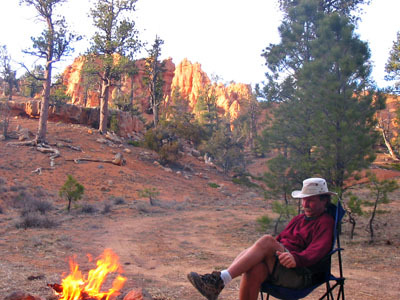 Many other guidebooks and websites will tell you about campgrounds but not the free ones. Through eighteen years of shunpiking (driving the back roads), we've discovered many boondocking locations. Most are right on route to southern Utah's major attractions. If you prefer to camp in scenic free campsites, prefer traveling around rather than staying in one place, and are looking for affordable adventures and variety in your RV travels, you need this guide. This guide is not just for RVers. 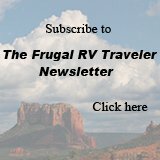 All but 13 of the 129 suggested frugal (mostly free) campsites listed in this guide are suitable for tents as well as RVs. Footnotes for each camping suggestion tell you if a tent can be set up. The footnotes also suggest what size of RV can most easily access the sites. Detailed directions including GPS coordinates to every suggested attraction and all 129 campsites. A route map provides a visual image of the suggested routes and the scenic free campsites found along them. one. Easy Referencing: The book is divided into color-coded sections corresponding to the three different geographical areas shown on the map. A full index at the back of the book is also a helpful tool. 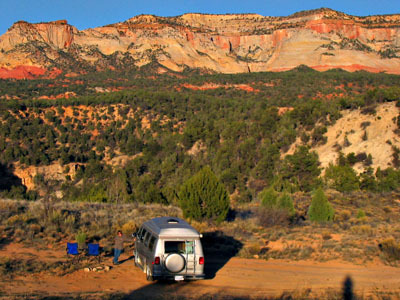 A detailed one-month itinerary covers the most popular southern Utah destinations. Follow it, see all the major attractions, and spend less than $80.00 in camping fees for the entire month (at big-rig-friendly campsites)! Hiking suggestions. We love to hike so we've listed some of our favorite southern Utah hikes. A Camping Accessibility Footnotes. Quick reference footnotes for all 129 camping areas show whether a tent can be set up and what size of RV can easily access each site. 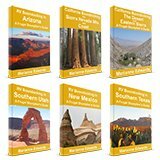 These guides are wonderful, with very accurate GPS coordinates for dispersed camping sites on BLM and National Forest Service land. Though we never shy away from an adventure and have boondocked before, it is daunting to drive down a dirt road (pulling a trailer) looking for the perfect spot without knowing if you’ll be able to turn around. Been there, done that! And pre-scouting takes a lot of time. With these guides you can rest assured you will not get stuck. Marianne is very detailed about what size rig can fit in each spot with great descriptions of the astounding views that await you. This guide is worth every penny! I purchased your Utah book for a trip we took last July. Because I don't like crowds, I wanted to find some good, off-the-beaten-path camping spots where we could be alone. For this reason, and the fact that I am cheap and wanted free camping, I bought your book. We have been anxiously waiting for you to publish Utah - our most favorite state. We have been to Utah numerous times but never with free campsites. Can't wait! I can't help being so excited about your books. They are exactly what my husband and I have been searching for ( for years ). If only we had these when we only had three weeks to travel in. The books will be of great value to us as we plan to travel all winter; starting in Texas (for warmth) and moving up to Utah as the weather allows. Then starting over and over again as the years go by. Just want to let you know I have just hiked Calf Creek Trail and you were right!!!! Incredible adventures these last three weeks and your Arizona and Utah guidebooks were FANTASTIC!!! Yes you can quote me. Thank you so much. You have saved me money and shown me incredible sights! I now look forward to November and using the books again on my way to Mexico. < To Purchase This e-book For Immediate Download Now.